Easter holidays ruled, what came after drooled. Yes, Illogicopedia is experiencing one of those activity fluctuations, but since it seems to go through them on a regular basis I suppose nobody cares too much. Still, it's nice to see a return to the amicable chatting and gentle, non-controversial article writing we had before Membergate, as nobody likes to call it. So anyway, I'd best succumb to peer pressure and talk about the General Election or something. 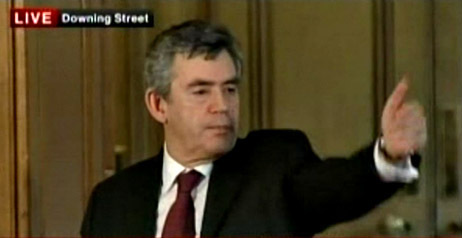 I have included a picture of Gordon Brown in this post. There, with that out of the way, back to the Illogicality. Anyone been to Uncyclopedia recently? Last I heard it was devouring itself backside first. Blasted vandals, I ought to squirt them with my water pistol ray gun! Wikipedia ain't much different, according to form. Something about dodgy pictures or something. Oh, where have we seen that before? Ah, this is surely the work of Roberto! Anyhow, must dash. The cryptids draw near, and they appear none too friendly.